A native of Milan, violinist Roberto Cani studied at the Milan Conservatory of Music, the Gnessin Institute of Music in Moscow and the University of Southern California. He has studied with Miroslav Roussin, Zinaida Gilels, Pavel Vernikov, Viktor Tretiakov, Abraham Stern, and Alice Schoenfeld. Roberto Cani made his debut at Gaveau Hall in Paris under direction of maestro Daniele Gatti on 16 January 1987. He has concertized in his native Italy, Russia, Poland, Croatia, Germany, Austria, Belgium, Spain, Serbia, France, Taiwan, Japan, and South Africa. He has performed as soloist with La Scala Orchestra under Riccardo Muti, Bolgograd Symphony Orchestra, Moscow Symphony Orchestra, RAI Symphony Orchestra, Haydn Orchestra, Orchestra Cantelli, Missouri Chamber Orchestra, Central Symphony Orchestra of Oregon, and the Italian Consort. He has played in venues such as Los Angeles’s Royce Hall, Moscow’s Bolshoi Zal and Tchaikovsky Zal, Belgrade’s Lisinski Hall, Bristol’s St. Georges – Brandon Hill, Tokyo’s Suntory Hall and Milan’s La Scala. 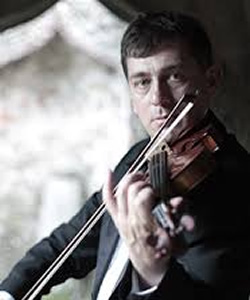 He has been guest concertmaster for the London Philharmonic and the La Scala Philharmonic. In addition, Roberto Cani has collaborated with world-class artists such as Massimo Quarta, Enrico Dindo, Andrew Shulman, Jeffrey Swann, Lynn Harrell and Justus Frantz. Roberto Cani was a prizewinner in the Paganini (Genoa, 1990), Jeunesses Musicales (Belgrade, 1991), and Courcillon (France, 1991) International Competitions. He also won honours in the Tchaikovsky International Competition (Moscow, 1994). Roberto Cani plays on a 1735 Giuseppe Guarneri del Gesu ex Baron Knoop on generous loan from the ProCanale Foundation in Italy.